Savage Entertainment L.L.C. prides itself on high quality fights. Whether it’s Mixed Martial Arts, Thai Boxing, Brazilian Jiu-Jitsu, Gracie Jiu-Jitsu, Submission Wrestling or Boxing, expect to see high quality fights with fighters competing at the same skill level, we try very hard to make sure there are no mismatches, so come to our next show and see the difference. 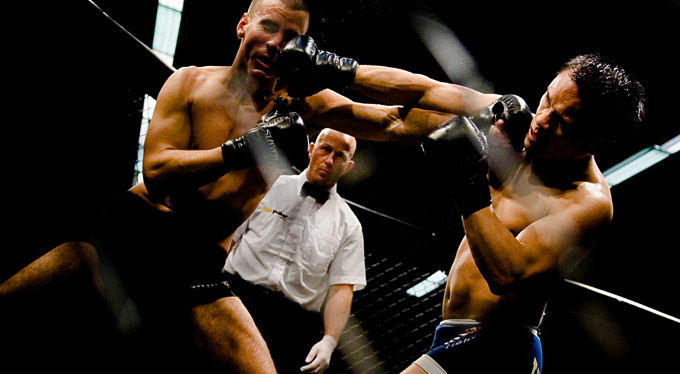 Savage Entertainment provides the upper midwest area with the finest in mixed martial arts, thai boxing and boxing competitions. If you would like to get ticket information, compete in one of the upcoming events, would like to host an event at your establishment, would like to be a Savage Entertainment Ring Girl, or have any other inquiry, contact Savage Entertainment at (952) 564-0092. Check out the complete information regarding weight and fight classes that are used by Savage Entertainment before asking to fight at our events. Our events page will have complete information as it is available, including locations, dates, ticket information and the card, for all upcoming events. See our past events page for a list of results from previous events. Our fighters page will give history, bios and pictures of fighters that will be fighting at any Savage Entertainment event. Join our fan page on Facebook and get the latest information about events and fighters in our events as soon as you log in to Facebook. It’s the biggest social networking site on the internet and the best place to stay current and connect with other local MMA fans. If you know of a cause that Savage Entertainment could help support, feel free to contact us. Two fights in a row now, the best cards I have seen in Minnesota! I’ve been to several local shows. Savage Entertainment has the best show I’ve seen. The match ups are even match ups. The fighters seem to give 100% effort. I’ve attended four shows at Savage Entertainment and have yet to see a match that I felt wasn’t appropriate for both fighters. It has made for great competition. Atmosphere is good too. It’s a good time and I will continue to attend events. Savage Entertainment has quickly become one of the premiere shows in town, as the last three events at Neisen’s have all been fantastic. I have yet to see a bad fight on any of their shows, and they go out of their way to keep the matchmaking even.